Utagawa Toyokuni I (1769-1825) Minamoto Yorimitsu and His Fellow Warriors the Shiten-no (Raiko sitenno to kidomaru), 1810’s. Oban. The left hand panel of an extraordinary and rare tour-de-force by Toyokuni 1st from the 1810’s. A masterpiece of drawing and a very rare foray by the artist into musha-e (warrior prints) that predicts the enormous success of his pupil Kuniyoshi and the popularity of these scenes a decade or so later. 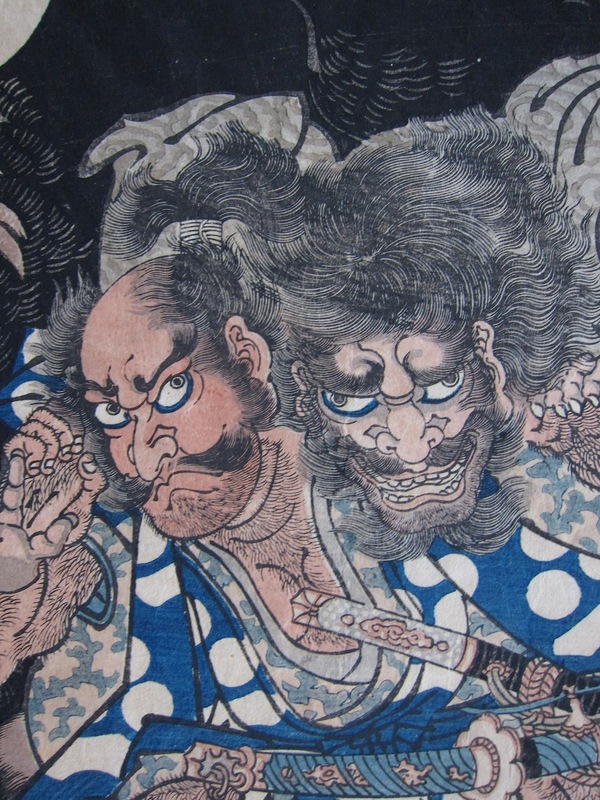 This is an important print, aside from being a magnificent piece of drawing and characterisation and a superb piece of printing which departs radically from the theatre pieces for which Toyokuni is remembered. Everything of Kuniyoshi’s startling and ground breaking series The 108 Heroes of the Popular Suikoden of the late 1820’s is here in this print. 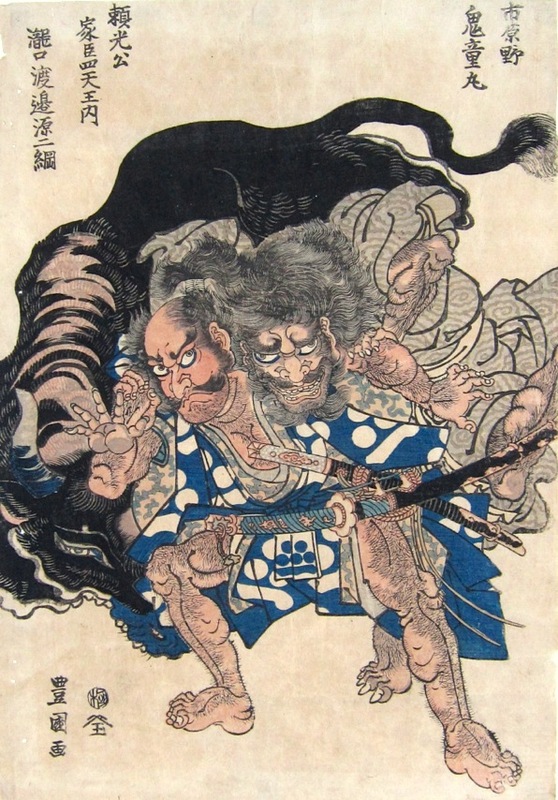 The extraordinary character studies of the wrestling men, the bristled muscles and the contorted bodies, the twisted limbs that fill the composition as if unable to be contained, the strong, calligraphic lines of the patterned fabric and the presence of a mythical beast were all co-opted by Kuniyoshi to great acclaim and remain synonymous with his best work. Toyokuni illustrates two retainers of Minamoto Yorimitsu (948 - 1021) wrestling each other to escape the charge of an enraged black bull. Minamoto was a legendary warrior and the first of the line of these heroic figures. He is usually shown accompanied by four legendary retainers known as the Shiten-no. It is an outstanding piece of work and very rare; there is one other copy of the complete diptych in the American Library of Congress. The print would have been issued as two separate pieces to be viewed individually or together and the composition of the print is perfectly balanced. The colour and impression are exceptional, condition overall is very fine excepting a flattened crease and some toning. Small paper loss top left. Signed Toyokuni ga, published by Morita Hanjiro (Honzo).